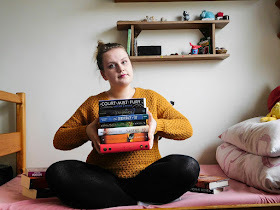 Girl with Cloudy Head: How to read more books? Lately I looked at my Goodreads challenge and I was surprised by the number showing up. I've read 78 books yet and it's the middle of the year!!!! For someone it might not be much but for me it's record. That's crazy! I don't even know how that happened because I had uni, I was getting enough sleep as well as social life. 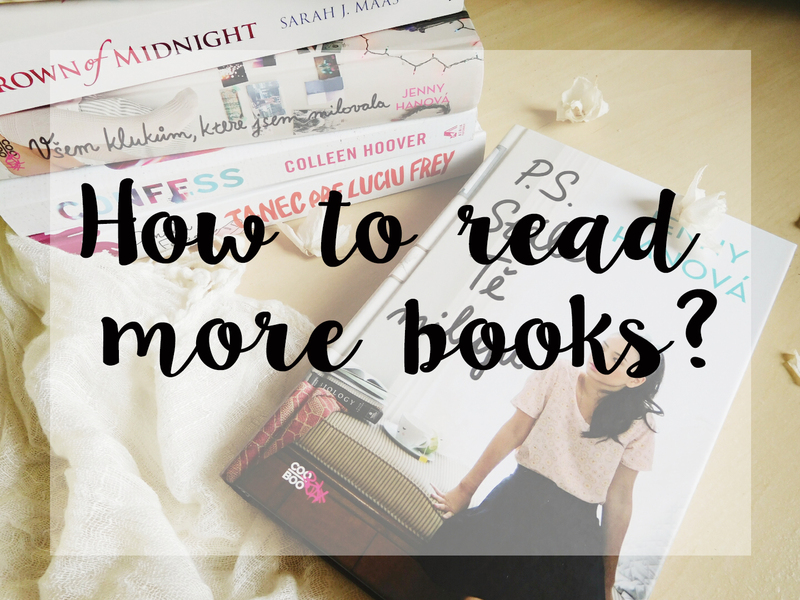 Though I think I might know what it did so let's jump right to my tips and tricks on how to read more books. I know you want to read faster. We all have that big TBR pile that's threatening us with cruel death. Audiobooks are precious little things that will immensely help you with your tbr pile. Let me explain. My ride from campus to school and back lasts about an hour. (Yeah, it's that far.) Multiply that by five days and ta-da you almost have one book. Isn't that crazy? Audiobooks are your friends. Welcome them. Offer them tea. Though, they don't have to be for everybody which is okay, we're all different. I don't go out without my kindle. That's how strong our friendship is. When I'm planning on going somewhere, I'll choose my bag so that my kindle fits in it too. You never know when you'll have time to read. For example, I cannot imagine my day at school without it because we have long breaks between seminars, sometimes even two hours. What do I do? Well, I go for lunch and if I'm alone that day, I'll take out my kindle and read. Sometimes I'll even take it out in seminar. Especially if the profesor is boring and he can't see me otherwise I'd just sleep it through. Am I waiting alone for somebody? E-reader! Am I falling asleep on lecture? E-reader! Am I waiting for friend? E-reader! Is world falling apart? E-reader! Basically e-reader is the answer for everything. It is said that person needs at least eight hours of sleep each night. I can function with only three hours of sleep, and sometimes I'm even more awake than after eight hours. That leaves me with five hours of reading! That's at least a half of a book. Now I'm not telling you to not sleep because you want to conquer your tbr pile, but sometimes the book grips you sooo much that you cannot put it down, am I right? Those situations can help you read more books. But let's be honest, sleep is the best thing. Who else fell asleep while reading a book? The main reason for the big number of books I've read is that I stopped watching TV series and movies. I just wasn't in mood for them this year and yes, I still have some because Supernatural!!!!! Hands up those of you who are supernatural fans! This way I had lot of free time for reading which helped me with my tbr pile. It's up to you to decide what's more important for you, so think about your priorities. Okay, so at the beginning of this year I told myself I will get better at reading. I wanted to read faster and so I forced myself. Well, let me tell you, I was really bad at it. Sometimes I flew over words not getting their meaning and I often had to get back and re-read some parts because I didn't know what was happening. BUT it was getting better and now I can see the difference and I can read a little bit faster. Sometimes... uhm almost all the time... I will look at how many pages the book has because smaller books are easier to read. If the book has around 300 pages, I can read it whole on my way from uni to home. Now, I'm travelling home for weekends so it means I travell A LOT which means I get a lot of reading done. Of course if I don't fall asleep on the train. That's too tempting. Also, it's the worst enemy of reading, not to mention you can wake up a town waaaay past your stop. Also, contemporary books are generally easier to read than fantasy books and so you can read them faster. If you're reading book you really love, you will read it a lot faster than book you absolutely hate. That's why you should pick your books strategically but don't forget that you should also pick books according to what you like. We should read mostly because it's fun and because we love the story. Reading shouldn't be some kind of marathon or a competition. Goodreads challenge can be good in a way that you'll get inspired by your numbers. You can compare your reading throughout years. It can have also negative effect. You can see all those numbers of your friends and feel like you're not reading fast enough. In that case you can run through books just to catch up but you're not going to enjoy them. Think about why you love reading and focus on that rather than on numbers. After all we're here for the magic, right? Let's talk: Do you have any advices on how to read faster? If you do, let me know in the comments down below. What's your goodreads challenge for this year? How are you doing? Are you ahead of your plan? Also, do you love Supernatural because if not I don't think we can be friends. And pfft who really needs sleep? Okay, #lies. I DO. But I basically do 5hrs because I'm not so good at sleeping.😂 LOTS MORE READING TIME! And also audiobooks = lifesavers. You can just get so many more reading hours in while you're doing mindless jobs or whatever! IT'S THE BEST. If only I had thought about using audiobooks back when I did loads of driving. I could've gotten through so many books! And I always hated the driving for the sole fact that I felt like I was wasting time, so it would've been a perfect solution. And yes, ebooks really do help because you *always* have your book with you that way. And I do often end up sacrificing sleep for books lol. But like you I don't watch a lot of TV and movies, so that gives me time to read, and I've started trying to not waste any time just sitting around. Like, if I have food in the oven or something, instead of just plopping down on the couch to wait for it, I'll read. Stuff like that. So I think I've started getting more reading time in this year too. DUDE ONLY 3 HOURS OF SLEEP??? My greatest tip to read faster is keep reading. I notice when I am in a reading kick I read faster, when it's been awhile, I read slower. So the key is to keep reading. You have some great advice too. I don't have as much travel time as you but I should be able to fit audio books in somehow. Hmm I honestly don't know how I read quickly. I usually finish books in three days, or when I'm busy, five or seven. But I think it's mostly because I read two books at a time, and read a lot, like, whenever I can. My Goodreads Challenge is set at 50 books, and I unexpectedly finished that before I even reached half of 2016. xD I didn't even think I could overachieve that much haha. Lovely post, Simona!